A journalist and poet based in LA's East Side, Abel Salas is the publisher and editor of Brooklyn & Boyle a monthly community arts paper. 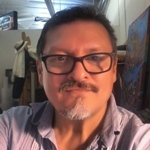 His poems have appeared in Zyzzyva, Huizache, Cipactli, Beltway Poetry Quarterly and Americas Quarterly Magazine among others, as well as the recently released Poetry of Resistance: Voices for Social Justice (Ed. Francisco X. Alarcón, University of Arizona Press, 2016) and Coiled Serpent: Poets Arising From the Cultural Quakes & Shifts of Los Angeles (Tia Chucha Press, 2016), two new anthologies. As a journalist, he has written for The New York Times, Los Angeles Times Magazine, Los Angeles Magazine, Latina Magazine and The Austin Chronicle.